Unmanned aerial vehicles (UAVs) are getting a lot of attention this week at the INTERGEO conference and exhibition in Berlin, Germany, where a special session on Tuesday (October 7, 2014), “UAVs in Practice,” focused on their use in airborne surveying and mapping, environmental monitoring, and other commercial or civil applications. 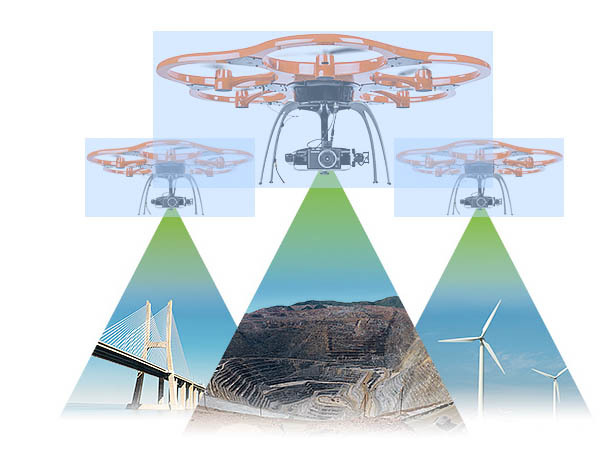 UAVs — most guided by GNSS — carry high-resolution digital single-lens reflex cameras, multispectral cameras, laser scanners and other sensors that supply highly accurate data used for a growing number of purposes. The conference has established a UAV Flightzone in the outdoor area at to provide a showcase for the aerial surveying and mapping systems on offer by exhibitors. Several manufacturers used the event to announce new initiatives in the field, heavily weighted toward companies from Germany and other European countries in which comercial UAVs are not as heavily regulated as in the United States. Today at INTERGEO, Applanix Corporation, a Trimble company based in Canada, announced its new APX-15 UAV GNSS-Inertial System, designed to maximize the efficiency of mapping by reducing — or even eliminating — ground control points (GCPs). Sidelap is also significantly reduced, according to the company, increasing the area flown per mission. The Applanix APX-15 UAV comes with the company’s POSPac UAV post-mission software that provides a position and orientation solution for direct georeferencing of cameras, LIDARs, and other autonomous airborne sensors. Measuring 6 x 6.7 centimeters and weighing 60 grams, the APX-15 features a survey-grade, multi-frequency GNSS receiver and low-noise microelectromechanical (MEMS) inertial sensors on a single board. The Applanix IN-Fusion GNSS-Inertial integration technology runs directly on the GNSS receiver while the inertial sensors use Applanix’s SmartCal software compensation technology. With 220 channels, the APX-15 UAV tracks all available GNSS satellite signals including GPS L1/L2/L2C/L5 and GLONASS L1/L2, QZSS, BeiDou and Galileo, and provides a post-mission and real-time kinematic GNSS-inertial position and orientation solutions. The APX-15 UAV is expected to be available worldwide in the first quarter of 2015 through the Applanix sales channel, according to Joe Hutton, Applanix’s director of inertial technology and airborne products. Aibotix GmbH, a Kassel, Germany–based company acquired by Hexagon last February, featured its Aibot-X6 V2 (pictured above), a six-rotor UAV that can carry payloads of up to two kilograms (4.4 pounds). Navigation is provided by a GPS receiver integrated with gyroscope, accelerometer, barometer, magnetometers, and ultrasonic sensors. The Hirrus Mini UAV System from Teamnet International, based in Bucharest, Romania, can carry CCD or IR video cameras, photo cameras, or radiation detectors and many other sensors. The Hirrus unammaned aerial system includes a pilotless plane, a command and control station and emission reception antennas. The aircraft can operate autonomously for almost three hours and, depending on its payload, can reach speeds of more than 110 km/h at altitudes exceeding 2,500 meters. Alerion, of Gilching, Germany, presented the Aquarion, a marine-based UAV capable of sending real-time HD video and other high resolution data from up to 50 kilometers away, according to the company. Another German compay, DIALOGIS UG, introduced its WORKDRONE UAV.